Join us from 5-8 p.m. on Friday, June 17th for a celebration of summer! 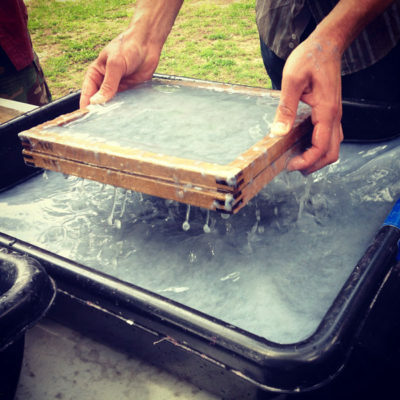 Participate in a hands on paper-making activity facilitated by Drew Cameron, the artist behind Combat Paper. Combat Paper transforms military uniforms into handmade paper, accentuating the inherent personal and social attributes of the material. All materials will be provided and visitors can participate on a drop in and out basis. In addition, there will be musical performances and workshops, tours, pizza, and beer-tasting! Everyone is welcome and RSVPs are not required. We hope to see you here! This event is free for veterans and service members and their friends and families. The Portland Art Museum offers free admission to the nation’s active-duty military personnel and their families from Memorial Day through Labor Day as part of the Blue Star Museums program.